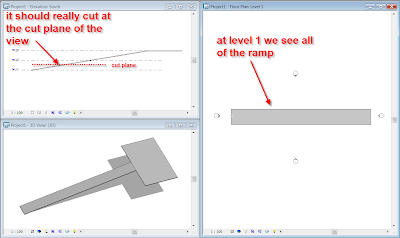 Revit : Ramps don’t cut?? I had a query recently about ramps cutting in plan. One annoyance in Revit is that ramps will not automatically cut on plan based on the cut plane of the view unlike like staircases. There certainly doesn’t seem to be any way to automatically achieve this from what I can see. If you take a look at this screen grab, you will see what the issue is and the differences between a stair and a ramp. 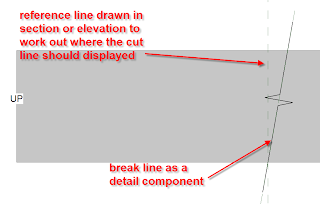 Therefore the only way to achieve this in Revit is to use a combination of the linework tool, a mask region and then add a break line were you want the break to display on plan. 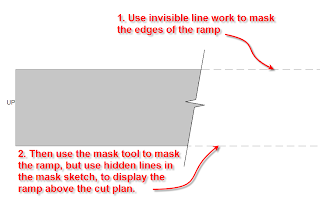 If you take a look at this image below, you will see that a combination of a mask region, invisible lines and hidden lines have been added to display the ramp as we require. It’s also worth using a reference line in section to work out where you want the cut to display in plan, based on the cut plan for the plan view. This is the resulting ramp in all its glory with added linework and mask region. what about visibility below the mask region ...incase we have parking space component below that ramp how it could be shown along with a pavement ? in my project i have the same situation. How can I show the objects that there are below? export the ramp, import it as a mass, then it will be cut through just like any other object. For identification purposes, use a shared project parameter to capture the function of masses to help with counting ramps in schedules, etc.